This past weekend, I went to New York City for the wedding of two dear friends, Gerold and Rory. (This was no ordinary wedding -- Rory was in the original cast of The Book of Mormon, and both men have huge families and are extremely popular to boot. The guest list included some of Broadway's elite, and it was definitely an experience like no other!) But I digress. I thought that both my return to NYC and the fabulous wedding I was attending definitely warranted an equally fabulous mani -- so I headed to none other than Paintbox in Soho. Paintbox isn't your typical nail salon. For starters, they only do manicures -- and they specialize in nail art. Exquisite, unbelievable, off the chain, notice-me-right now nail art. Their menu includes so many different types of art, which are curated mainly by one of the salon's owners, manicurist Julie Kandalec, and they change every season. I had a tough time deciding which manicure to try for my first visit, but I finally settled on the Hot Shot. The Hot Shot takes your choice of base color and, after two coats, involves stamping at the moons with different colored foils. While the menu has suggested color choices, my manicurist, Yuko, and I decided upon a light grey base with RGB Dove and then foils in gold, leopard-spotted turquoise and royal blue. My dress for the wedding was a bluish purple silk, so I wanted a manicure that would work well with that color. I have to say I'm pretty impressed by the final result! This is definitely not a manicure I would do myself, and I think it's so much fun. I'm glad I chose this one! And here's the coolest part. 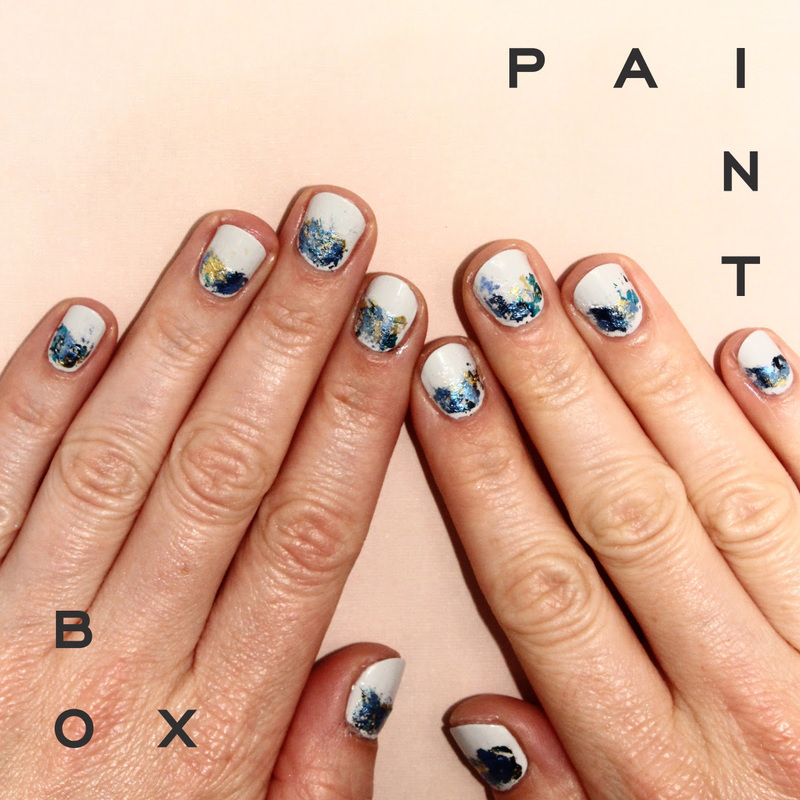 Paintbox has its very own mani cam so you can get the PERFECT shot of your PERFECT manicure! The photo you see above was taken in the mani cam. You simply input your email address, slide your hands into the box and snap the photo -- and voila! Everyone can see the stunning creation you just got. Manicures at Paintbox are $65 for gel and $55 for polish. Single color manicures are $50 for gel and $35 for polish, while accent nails are $10 and $5, respectively. For more information about Paintbox and to book an appointment, visit paint-box.com. Wow, I really love this look, it's so eye catching! What a unique mani idea! Love it. It looks so fun and unique!